Steph Curry proved naysayers wrong when he shot a 74 on Thursday and Friday of the Web.com Tour’s Ellie Mae Classic. 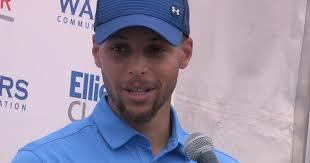 Curry received a sponsor’s exemption in order to be able to compete. There were some people who believed that he may have taken a spot that someone who depends on golf to make a living may have needed. Others thought he would fail miserably. The biggest story from Curry’s professional golf debut was the amount of new spectators who came to watch him play at TPC Stonebrae. There was no doubt that the majority of the gallery watching the tournament had never attended a professional golf event previously. The tournament was a success for all involved. The players had a larger gallery watching them play, the Web.com tour received greater exposure, and the Ellie Mae Classic raised a considerable amount for the Warriors Foundation. Also, Curry proved that, if he were to ever want to leave professional basketball, he can be competitive in professional golf.